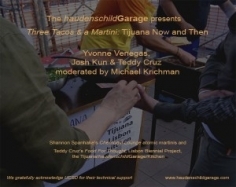 On October 19, 2007 the haudenschildGarage organized Three Tacos and a Martini: Tijuana Now and Then, a conversation with Josh Kun, Yvonne Venegas, and Teddy Cruz, moderated by Michael Krichman. 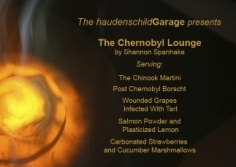 The evening began with Shannon Spanhake's Chernobyl Lounge with chinook martinis, post-Chernobyl borscht, wounded grapes infected with tart, salmon powder and plasticized lemon, and carbonated strawberries and cucumber marshmallows on a stick. 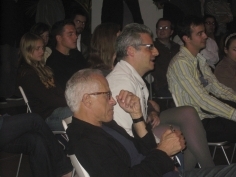 The evening ended with Teddy Cruz's Food for Thought: The Tijuana - haudenschildGarage Kitchen. Food for Thought is an open-air kitchen, serving authentic Tijuana tacos in an exchange of food for thought. 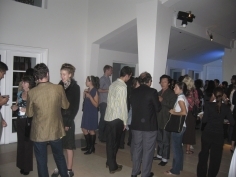 Teddy Cruz’ work is centered along the border between San Diego, California, and Tijuana, Mexico, where he has been developing a practice and pedagogy that emerge out of the particularities of this bicultural territory. 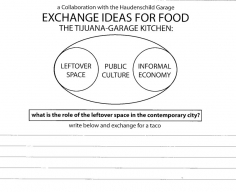 Participants, in exchange for a taco, filled out a postcard asking "What is the role of the leftover space in the contemporary city?" 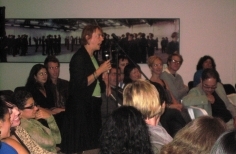 This event was conceptualized and organized by Eloisa Haudenschild and Steve Fagin.